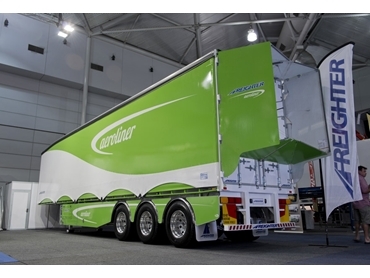 Leading trailer brand, Freighter unveiled a one-of-its-kind aerodynamic concept trailer, aptly named the Freighter AeroLiner at the Brisbane Truck Show. Giving a glimpse into the future, the trailer features a number of aerodynamic components and is based on the brand’s patented EziLiner trailer with efficient buckle-less curtains. Design highlights of the new Freighter AeroLiner include side skirts, sloping roof, automated tyre inflation and the first boat tail approved for trial on Australian roads. Stuart McMurtrie, MaxiTRANS Group Marketing Manager says the boat tail in particular is a ground-breaking development with the company working closely with state regulators to gain approval for operating an on-road evaluation trial on a boat tail device in Australia. McMurtrie explained that they decided on the AT Dynamics ‘Trailer Tail’ following an extensive review of available boat tail devices. Freighter has gained transport authority approval to coordinate a trial with the AT Dynamics product in NSW, Victoria and Queensland, with up to 15 combinations set to hit the road in the coming months to begin gathering data. The trials will last for one year. While McMurtrie says that Freighter and Maxi-CUBE have been fitting aerodynamic side skirts for some time now, the skirts on display have several useful features including lift-up panels for easy access to the spare tyre and also compliance with under-run protection requirements. Their lightness in weight and strength is a result of the use of honeycomb reinforced MaxiLITE panels made in Melbourne by MaxiTRANS. Being flat and modular, they are easily repaired or replaced if damaged. A sloping roof is the other eye-catching feature of the Freighter AeroLiner on display in Brisbane with the front quarter of the trailer roof having a moderate gradient, lowering the leading edge of the roof by 240mm, which McMurtrie says is intended to line up with the adjoining prime mover’s ‘air scoop’ in order to reduce drag from airflow buffeting the front of the trailer. He claims that the sloping roof has a great deal of potential as an aerodynamic measure with UK tests showing potential fuel savings of around 7% on this feature, resulting in probable payback of less than a year when used predominantly on line-haul applications. Freighter engineers will be undertaking tests on the sloping roof in the coming months to confirm these figures. The AeroLiner also features an automated Meritor tyre inflation system, which has the potential to provide fuel savings of 1-4%, while increasing tyre life by up to 10%, according to the Australian Government Energy Efficiency Exchange web site figures on the advantages of maintaining correct tyre pressures. McMurtrie is bullish about trailers such as the AeroLiner becoming a constant on Australian roads, given the rising cost of fuel. The AeroLiner on display at the Brisbane Truck Show could lead to important savings for operators in the near future.